The British fashion industry was out in force last night, for a night to celebrate its success at Buckingham Palace. 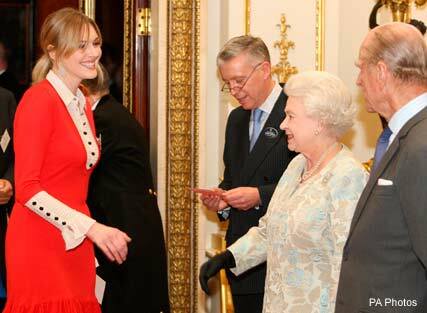 The Queen and the Duke of Edinburgh hosted the stylish bash, which brought together homegrown designers such as Alice Temperley, Christopher Kane, Betty Jackson, Julien Macdonald and Jasper Conran. Representing Britain’s formidable force on the catwalks, there were plenty of model faces, including Twiggy, Yasmin Le Bon, Sophie Dahl and Erin O’Connor. And though there was no end of style on show, it was Her Majesty receiving praise from the fashion industry’s leading lights for her chic Angela Kelly suit and coordinating accessories.